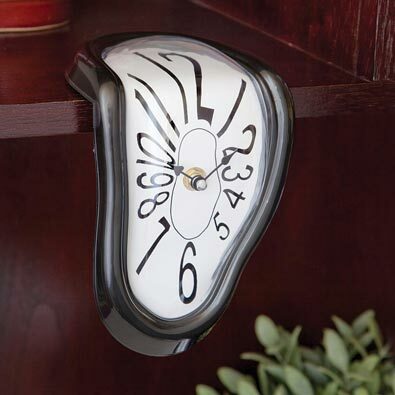 Our eye-catching clock is inspired by Salvador Dali's painting, "The Persistence of Memory." The perfect complement to those days when you want to watch time melt away! Hangs on any shelf, ledge or desk for a surreal attention getter. Made of high impact plastic, measures 7" x 5". Requires 1 "AA" battery, not included. Our beautiful peacock clock features a laminated 1924 French magazine print laminated to masonite and surrounded by a teal steel cage. The hanging tail feather swings with the time. An elegant focal point for any room in your home. The clock measures 24" long x 9-1/2" wide and stands on feet 1-3/8" away from the wall. Hanging bracket on the back side. Requires 2 AA batteries, not included. *Sorry, No Express Shipping and Gift Wrapping for Peacock Pendulum Clock. Hang our wall clock from the mechanism on the back and shadows are cast creating a lifelike dimensional window. Each window features a different whimsical, silhouetted cat. The silver-toned quartz clock requires 1 AA battery, not included. 17-5/8" square. *Sorry, Gift Wrapping Not Available on Cats In The Window Clock. Test your knowledge when telling time. Each number space features a mathematical equation to keep your math skills sharp. Black clock face is made to look like a chalkboard with each math equation painted to look like white chalk. The perfect gift for your favourite brainiac. Made of plastic, with silver-toned metal hands. Rwquires 1 AA battery, not included. Measures 11-3/4" in diameter.